• Designed to meet IEC 61010-1 and IEC 61557 safety standard. • 1mA rated test current at the minimum resistance. • 200mA measuring current on continuity testing. • Automatic discharge of circuit capacitance. • Live circuit warning buzzer and neon lamp. 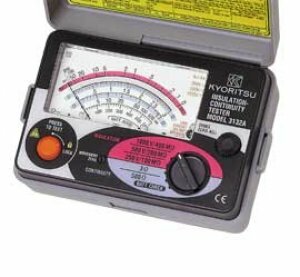 • AC voltmeter with linear, easy-to-read scale. • Operates on AA, R6P×6 dry batteries.